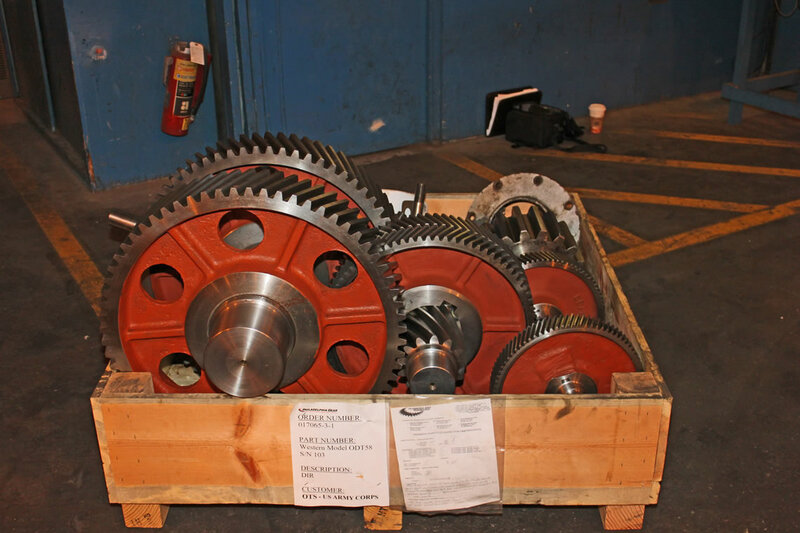 Gearbox Condition Assessment | VGO Inc.
To accomplish this, VGO engineers traveled to the gear manufacturer’s facility in California and inspected the gears by wet fluorescent magnetic particle testing (WFMT). Because the manufacturer had already inspected the gears, VGO’s inspection was not intended to encompass the entire surface of the gears or shafts, but rather, was focused on a few of the areas where the manufacturer had already found cracks during their inspection. The inspection—which was being performed by the manufacturer’s technicians under VGO’s direction—was done utilizing the so-called “headshot” technique whereby a circular magnetic field is imposed in the gears via electrical current applied through the ends of the gear shafts. During their inspection, VGO engineers photographed the WFMT crack indications on the gears as a means of documenting them for further analysis. Subsequently, gears from three of the gearboxes were sent to VGO for laboratory analysis of typical defects found during the inspection. The 12 gearboxes examined by VGO engineers at the manufacturer’s facility were comprised of ten herringbone-type, parallel shaft reducer gearboxes and two worm reducer gearboxes. The herringbone gears were carbon steel castings, while the worms from the worm reducer gearboxes–as well as the shafts from all gearboxes–were carbon steel wrought material. The vast majority of WFMT indications on the gears from the herringbone gearboxes were clearly due to casting defects–primarily shrinkage cracks and shrinkage cavities/voids. In most cases, the appearance of the cracks and other defects indicted no service-related growth had occurred; thus, since the gears had already been in service for 45 to 60 years with the cracks/casting defects present, in the majority of cases, they were considered to have only a low probability of failure. However, in a few instances, the possibility of minor service growth from the casting defects could not be ruled out. Thus, in these instances, a higher level of concern was indicated; however, in no instances were any cracks found that would suggest failure of the gears was imminent. Most of the indications on the herringbone gears were on the hub, in areas where the casting defects had been exposed by machining; however, a considerable number of indications were also present on the gear teeth and/or the face of the rim beneath the teeth, again, in areas where the defects had been exposed by machining. In a few instances, isolated linear indications were found in the tooth root or on the rim adjacent to a tooth root; the isolated nature of these indications and their presence in high stress areas suggested the possibility that some of these indications may have been service-related cracks rather than casting defects. Both worms exhibited WFMT crack indications on the teeth. In one case, the face of the teeth exhibited numerous, multi-directional crack indications suggestive of grinding cracks. In the other case, the top land of the teeth had a few longitudinal crack indications. None of the indications were suggestive of service-related cracking. A few linear indications were also found on the shafts for the herringbone gearboxes. In some cases, these indications were due to small cracks and/or incomplete fusion defects associated with previous welds in the keyways, apparently made to hold the keys in place. Although the cracks at these locations were quite small, in some cases they were transverse to the shaft, which raises concerns about the potential for service growth in the future. In other cases, the origin of the indications was not readily apparent during VGO’s field inspection; in particular, several shafts exhibited longitudinal, linear flaws. The longitudinal orientation of these flaws indicates they were not service-induced cracks, but rather, manufacturing- or materials-related flaws; as such, they were not considered to present a threat of failure. Laboratory analysis of the defects on one of the cast, herringbone gears confirmed that the defects were original casting defects in the form of shrinkage cracks and shrinkage cavities. No evidence of service-related extension of the cracks was found. Laboratory analysis of a linear defect on the surface of a shaft from one of the herringbone gearboxes showed that the defect was an original flaw in the material, probably a non-metallic inclusion, elongated during rolling of the raw material and subsequently exposed during machining of the shaft. The flaw was only about 0.003 inch deep. No service-related growth of the flaw had occurred. Laboratory analysis of the flaws in the teeth on one of the worms showed that the flaws were shallow, only about 0.005 to 0.020 inch deep. Although the analysis did not specifically confirm the nature or origin of the flaws, they appeared to be grinding cracks, dating from the manufacturing of the gear. No evidence of service-related growth of the cracks was found.